Johnny Tyler was working at radio station WGST in Atlanta, Georgia back in 1953. He recorded several tunes for RCA Victor. And later, had recorded for the Specialty label. 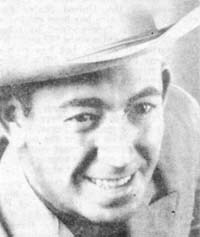 Sunny Ciesla reported in 1947 that Johnny was enjoying some success appearing at the Rancho and also in San Pedro. His recordings on RCA Victor at the time were a boost, with "Oakie Boogie", a tune he wrote. At times you would find little news bits or perhaps filler items the magazines would use to let fans know of a recent recording a star had made. But the writer of one such placement for Johnny Tyler was a bit more descriptive than most we've seen. An early 1949 article says his voice was "...tinged with the authentic flavor of Pocohontas, Arkansas..." It goes on to tell us about that new release at the time, "I Never See My Baby Alone": "...a sad complaint about a gal safely surrounded by relatives. Johnny paints a plaintive picture of his attempts to hurdle this barrier..." Talking of the flip side of the record, "Jealous Blues", the article states, "...Johnny tells with candor and frankness that the old Green-Eyed Dragon has got him in a dither." A 1953 article indicates he was working with Jimmy SMith and his Texans, who were doing nightly appearances at the Joe Cotton Rhythm Ranch in Atlanta. They were also being heard from 8:00pm to 12:00pm over WGST.